If you have purchased LUCI online via www.luci.eu your Activation code will be issued in your order confirmation e-mail. If you have purchased LUCI any other way you will also receive an e-mail with these important numbers. Be sure to save these numbers in case you need to re-install your LUCI Software. Registration is the process of unlocking your software for one particular PC. To activate, you request a unique ‘key-code’ that belongs to the particular PC you use to register and want to use LUCI on. When you buy 1 or more licenses for LUCI , you receive an activation code from us that enables you to activate your PC. Fill in the activation code and press ‘Register’. 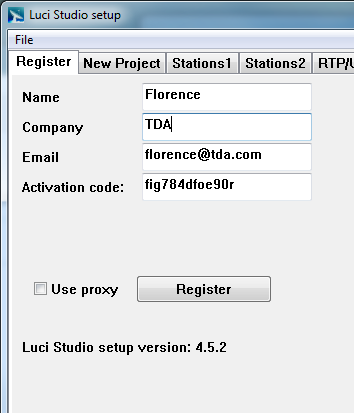 After successful activation you can go ahead setting up your LUCI Studio. If you purchased extra streams after you purchased and activated LUCI Studio you have to Register again in order to unlock the new instances. Please also check if the use of multiple instances is enabled in the Options page.